Historically turmeric comes from India, but has spread throughout the world especially in the tropics. In Indonesia in general can grow and produce well. This plant is in a pseudo stem that is composed of leaf midrib with a maximum of 25 â € "100 cm. Elongated oval-shaped leaves, light green, terraced compiler leaves each plant had about 6 â € "10 leaves. Elliptical rhizome and branch out. Turmeric grows well in soil that good irrigation system, rainfall 2,000 mm up to 4,000 mm per year and in a slightly sheltered. But to produce a larger rhizome needed a more open space. Young rhizomes and yellow skin and yellow flesh, after the old rhizomes into the orange skin and flesh browning slightly yellow-orange light. Turmeric rhizome contain ingredients such as oil adsiri, phelkandere, sabinene, cineol, zingeberence, turmeron, champene, camphor, sesquiterpene, caprilic acid, methoxinnamic acid, thelomethy carbinol, curcumene, and dyes that contain alkaloids curcumin. Curcumin is a yellow dye which was conceived by turmeric, an average of 10.29%, has a broad spectrum of biological activities, among others hepatotoxic, antibacterial, and antioxidant. Turmeric rhizome are mainly used for kitchen purposes (spice, food dyes), cosmetics and in traditional medicine. Traditionally, the water decoction of rhizome mixed with a small cube used as a water rinse mouth for swollen gums. While the ointment of turmeric with kawak acid used for the treatment of leg wounds. Ointments made from a mixture of turmeric with coconut oil is widely used to cure swelling legs and to remove fluid causes swelling. There's more, turmeric knead with seed clove and jasmine are used for medicine liver inflammation, and skin diseases. While turmeric root knead can be used as an external medicine swelling and rheumatic diseases. Turmeric can also be used for hair care in order to be free from dandruff, the way is as follows: take turmeric, peeled and then washed besih, was taken after the juice and rubbed on the scalp with a massage-massage. Allow 3-5 hours to extract kunyitnya sink in, then the hair on the scalp and wash thoroughly. Do this several times until the dandruff disappears. 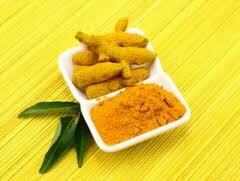 In addition, turmeric also can cure diarrhea, acne, skin care, arthritis, ulcers, hepatitis and diabetes. For the treatment of diabetes how to set up a turmeric rhizome, then washed and thinly sliced​​, add Â ½ teaspoon salt, put into a saucepan containing 1 liter of water and simmer to boil, strain and drink the water Â ½ cup a day. Security studies (toxicity test) to show turmeric, turmeric extract safely be used in therapeutic doses. Turmeric rhizome is administered orally no teratogenic effects (effects on embryo / fetus) in rats. Security extract of turmeric during pregnancy has not been proven, use during pregnancy should be under medical supervision. Turmeric extract excretion through breast milk and its effect on the baby has not been proven, you should use during breastfeeding under medical supervision. Good luck.